A cultivar of Camellia japonica L., ‘Spofforthiae Carnea’, bred by William Herbert, is very similar to ‘Spofforthiae’ but with larger, pink flowers. [ICR]. This may well be the plant figured by Berlèse as ‘Spofforthiana rosea’. [Berlèse Iconographie vol.III pl.203/1843]. Herbert also describes ‘Spofforthiana rosea’: ‘From the Pompone. – 13. v. Spofforthiana rosea, or Iduna; superior to the Peony-flowered in form and colour; the flower always has some anthers like its parent.’ [Herbert Amaryllidaceae p.368]. Listed in the 1850 and 1857 catalogues [T.261/1850]. 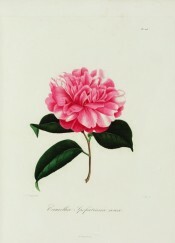 ‘Spofforthiae Carnea’ was also marked with an ‘H’ in William Macarthur’s hand in an 1850 catalogue held at Camden Park. Possibly obtained from Loddiges’ Nursery. It was listed in the 1836 edition of Loddiges’ Nursery catalogue, a copy of which is held at Camden Park [CPA]. Macarthur wrote to Loddiges on 6th January 1845: ‘I am very desirous to have the best of Mr. Herbert’s varieties’ and ‘Spofforthiae carnea’ was included in the desiderata. [MP A2933-2, p.28].